Please note that parking is FREE on Monday because of President's Day. That includes street parking at meters and in lots across Monroe Avenue and the lot on the south side of the restaurant. Alice Marie Beckwith, 80, died Tuesday, January 29, 2019, at Blodgett Hospital with her children at her side. Born on September 22, 1938, in Grand Rapids, Michigan, Alice was the youngest of three daughters born to Josephine and Walter Maciejewski. She graduated from Catholic Central High School in 1956 and had three children with her former spouse, Lawrence Beckwith. 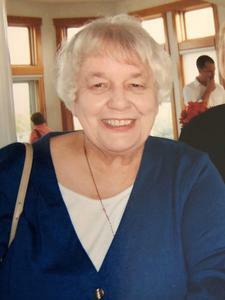 Much of Alice’s life’s work was spent serving the Grand Rapids Public Schools in various capacities, such as assisting teachers at Sigsbee Elementary School and at the Kent County Jail community education program. In time Alice moved to Grand Rapids Community College, where she worked as an administrative assistant in myriad departments before her retirement from the college in 2001. In the registrar’s office, students particularly appreciated her talent for cheerfully untangling the most vexing snags and mixups in their course schedules. Though Alice was loved for her feisty demeanor and scorching wit, she had a huge heart, always cheered for the underdog, and had a natural instinct to help those in need, be it the at-risk kids at the schools where she worked, an ailing nephew, or a lost dog. Among Alice’s favorite past-times were gardening, visiting Saugatuck, and spending time with her granddaughter and great grandchildren. Perhaps the trait that most defined Alice - and that came to define her kids too - was her love of animals, particularly cats. In addition to supporting animal welfare organizations and caring for countless stray cats, Alice also adopted many cats over the years and pampered them with unbounded attention and endless buffets. Alice was preceded in death by her parents and her sister Frances Winslow. She is survived by her sons David Beckwith and Joe Beckwith; Joe’s partner Lea Damasco; daughter Cori Beckwith and son-in-law Brent Futrell; sister Joanne Bailey and brother-in-law Robert Bailey; brother-in-law David Winslow; granddaughter Rachel Beckwith; great grandchildren Joseph, Logan, Trinity, and Alyx; and her loyal and pudgy-or-puffy-depending-on-your-perspective feline companion Pele. Alice also had close relationships with many nieces, nephews, colleagues, and neighbors, and an exceptional circle of treasured friends. All are welcome to join Alice's family and celebrate her life at 1:30 pm on Monday, February 18, 2019, at Linear Restaurant, 1001 Monroe NW in Grand Rapids. Please note that because Monday is a federal and local holiday (President's Day), parking is free. This includes metered spots on the street, the lot on the south side of the restaurant, and the lot directly across Monroe Avenue. Donations in Alice’s memory may be made to Crash’s Landing, a shelter for at-risk cats: https://www.crashslanding.org.